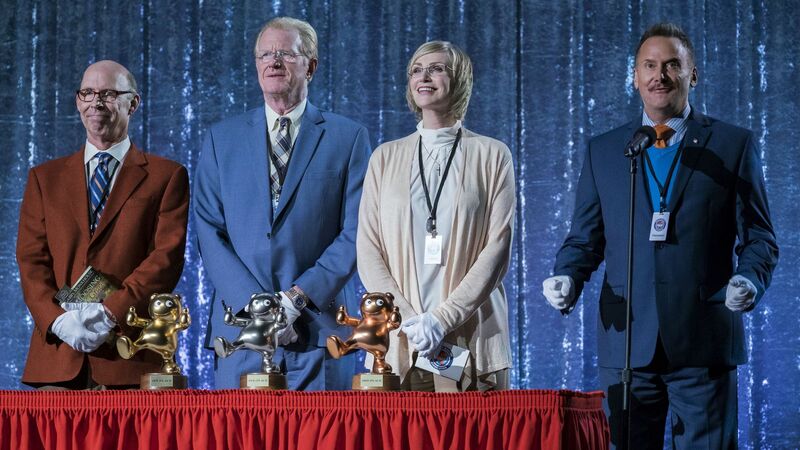 by Jake Triola Mascots, Christopher Guest’s latest installment of mockumentary magic, follows a group of mascots who compete for first prize in an annual competition. Like most of Guest’s characters, the people in this film are oddballs of a different breed and losers trapped in their own world. The story follows the typical “Guestian” formula, but it has a few shortcomings. Guest is one of my favorite filmmakers, and I’ve always been a huge fan of his brand of comedy. The perfectly crafted, awkward humor of his earlier films influenced modern weirdo favorites like Tim & Eric and Eric Andre. However, it’s clear the mastermind behind said earlier films has lost his luster and become stuck in a rut. “The big competition” is a storyline that has been used in several mockumentary films (Michael Patrick Jann’s 1999 Drop Dead Gorgeous is a great example). Guest highlighted the competitive nature of bizarre dog show participants in his 2000 hit, Best in Show — one of the greatest films ever made in this style of storytelling. But Mascots seems to be less thought out than its 16-year-old sister film. The main issue with Mascots is it lacks a sense of reality that effective films in this style are dependent upon. Verisimilitude is a key component of hooking the audience: it’s what makes it hilarious and uncomfortable when characters act like themselves. The concept of “competitive mascottery” is not exactly believable (because it doesn’t actually exist), and most characters seem more like caricatures of themselves, or, perhaps, who they’d be in reality. On the other hand, some characters are a little too realistic, or a combination of both too realistic and not realistic enough; Chris O’Dowd’s character, a promiscuous Irishman, for example, is an intensely frightening individual. He closes the film with a confession that he’s left the mascot life to become a monk, declaring “F*** it” straight to the camera. However, his flirting with Susan Yeagley’s usual ditsy cheerleader character has no punchline, making it even more realistic and uncomfortable than an audience would expect. It’s a difficult movie to feel out, despite its simple premise. Indeed, the well-executed performances, most of which are delivered from Guest’s regulars like Lynch and Willard, as well as Michael Hitchcock, Jennifer Coolidge, Bob Balaban, and, of course, Guest himself (who returns as Waiting for Guffman’s Corky St. Clair) form the bulk of the film’s appeal. Despite several golden scenes, Mascots still feels a bit too much like an intentional “comedy film” and less like the extremely uncomfortable documentary it is meant to come off as. More significantly it feels tired, as if all the tricks in the book have been used. It’s a total writer’s room sticky note: “Let’s make a movie about competitive mascots!” Okay, but then what? Christopher Guest’s satirical knack vanishes with Mascots. I don’t know if said knack will ever return, but does it matter? When Guest had it, he gave us This is Spinal Tap, Waiting for Guffman, and Best in Show, to name a few. And that, at the very least, is something to celebrate.